"I am filled with gratitude for Sharon's beautiful, healing presence. I've been privileged to be her client for several years now, always with a great benefit for my mind, body, and spirit, but it was during a recent challenging time in my life that I was truly transformed by her gifts and generosity. Through an intensive combination of energetic clearing, bodywork, and heartfelt, thoughtful dialogue, I was able to find clarity, grounding, and much needed inner calm. 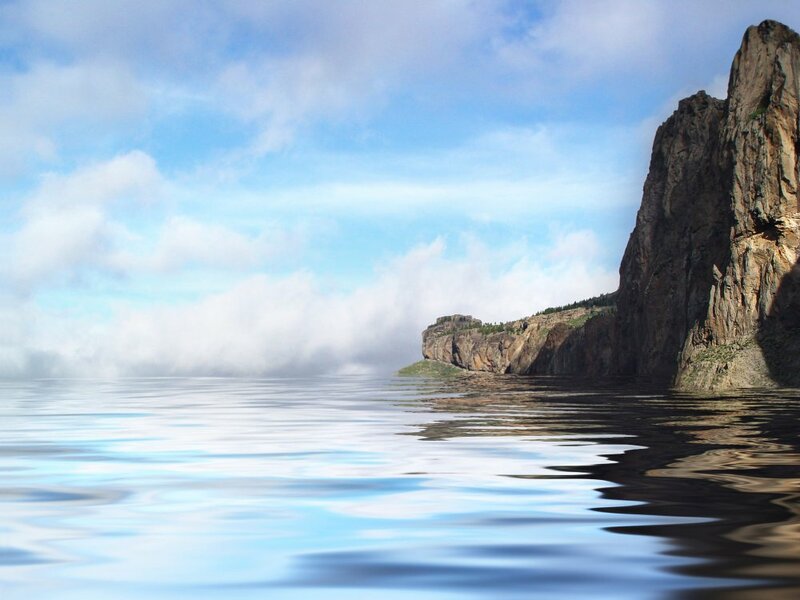 These tools allowed me not only to navigate the difficulties I was experiencing with relative ease and perspective, but also provided the impetus for creating positive, lasting change. Sharon is an intuitive, skilled listener with an expansive, kind heart. I look forward to continuing my work with her and highly recommend her offerings to others seeking greater balance, meaning, and joy in their everyday lives." Sharon has been a great catalyst on my journey of understanding myself. Her support, ideas, guidance, coaching, and creative attributes allowed for a time to relax, reconnect, and move forward. She's the perfect space holder, with so much compassion and understanding. She made the process so much more fun, and a lot less scary! 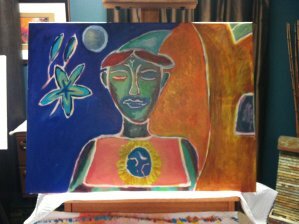 I received coaching, energy work, and art therapy with Sharon over the course of two years. It was grounding, centering, and such a joy. So grateful to have met Sharon!" "I cannot recommend Sharon's services enough! My family and friends have been going to her for the past 10 years and her practice and knowledge are always evolving to meet the needs of her clients. Her ability to tailor each session to the needs of her clients is truly unique, and her passion for healing others is clearly evident in all forms of her practice. Sharon has helped me physically, mentally, and spiritually to heal my body and self. She provides such a safe space and her concern goes above and beyond the value of the service you can expect to receive. Whatever is ailing you, Sharon can help you in discovering your path to healing!" Lindsey P.
"The biggest concern for me is maintaining "balance" and keeping connected with my overall well-being. The sessions provide a neutral space for focusing on that without the distraction of other influences. Each session also deepens my understanding of how to listen to my body. Often daily activities and stress do not present that opportunity. The goal of all sessions is to restore and revitalize. It is very helpful to establish a specific intention prior to the session. I trust your expertise and intuition that guides the awareness/healing process. Working with you has significantly changed the way I view the mind/body connection. Your approach to customizing each session has helped me through different challenges. The guidance you provide helps me beyond each session for practical application in everyday life." T. S.
"I have been much more able to ground myself by focusing my intent on doing so. My body is healthier and I've been more energetic. I also find that the fogginess of mind clears after sessions, and if I focus on keeping it that way I can stay de-fogged for a while. Through our sessions together, I have learned what being grounded and focused feels like, thus making it easier to get there on my own. I have also become more aware of my body, and more comfortable with it through the touch of another person." Sarah G.
"At this time, God is putting people and things in my path, I believe, to show me that my work here is not done. What I am doing, is having complete trust in God that he will lead me to my next thing in life. I have been having some physical issues that I believe are old wounds and injuries that I am now healing. "I cannot thank you enough for Saturday; I left feeling so much more grounded and that feeling has stayed with me since. I feel much more sound in my own mind, if that makes sense (my mental chatter seems more like a calm water than racing thoughts). I feel surer of myself and my decisions; I am using some of the visualizations we talked about (especially the threads of myself and weaving my own strength back). It feels as though I'm making progress for the inner peace and grounding I have been striving for but needed help getting to. I am so looking forward to our continued sessions! Thank you for spending the extra time with me on Saturday; I needed that safe space for everything to pour out of me. I'm feeling positive, hopeful, and strong." "Thank you so much for such a wonderful afternoon. The flow of the day was perfect. With the semester just ending we felt we were both in a very scattered state, but with the sound therapy we were already feeling much more grounded. I'm personally also going through a protocol for my candida overgrowth so the detox elements of the day were especially important for that reason. I would definitely like to understand the detox mechanism of the Kansa Vatki foot massage. It feels unlike anything we've felt before. Even after, we felt like our feet were still so happy and well. We truly had an amazing experience and really appreciate the time you spent with us." "I really enjoyed the experience of the medicine walk. I like the idea of setting an intention around a question and having your thoughts and experiences that evolve from the process mirrored back to you. Even though I spoke my experience to you, hearing it back in somewhat different words and perspective allowed my mind to observe it deeper giving me more of an opportunity to own it and understand it better. I especially liked the way you asked me from time to time if what you were saying felt congruent to my experience. Even though I realize the idea behind the medicine walk is to let thoughts/feelings naturally unfold in an authentic way, it did give me a feeling of having more control in what I wanted to tackle in my life by formulating the question specifically in the beginning. I’m very drawn to native american psychology and I feel that by striving for wholeness and balance a person can make better sense of one’s own psychology - the medicine walk helps the person look at their parts and then using that to create a whole, providing harmony within the natural world." Lydia M.
"I have learned throughout my life when presented with an opportunity that resonates, say YES! Today, I had a session with Sharon Lawlor where she introduced me to her innovative manifesting matrix technique. Her process is a holistic way of not only laser focusing on a desire, but at the end of the session you come away with tangible steps to achieve it. "I just had my [Creation Team] astrology chart read by Sharon and let me just say what a wonderful experience it was. It was moving. It helped me understand and really see me- all of me, where I have been and a path to my purpose. I am not just this or that I am a complex integration (a team) of many parts that want to work in harmony together. As an entrepreneur it allowed me to see how my business is a part of my greater purpose and it feels expansive and affirming. 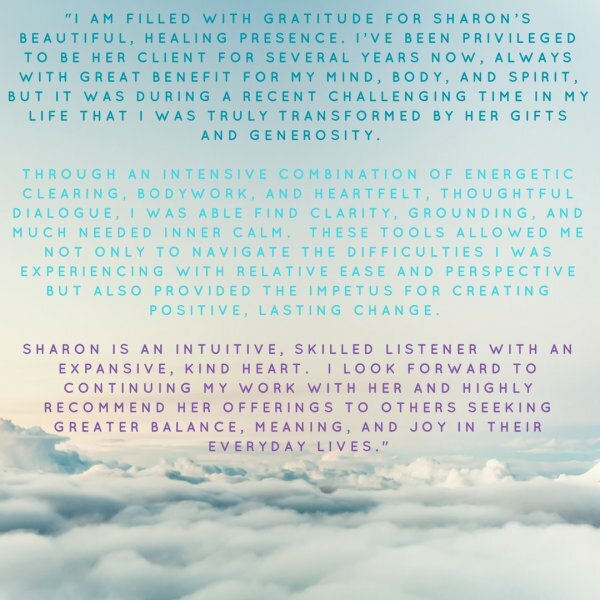 Sharon provided me with insight into the inner workings of me, what fuels me and what I came here to learn and brought light to my ways of seeing the world. I kept saying "yes" the entire session because I felt it so deeply within and felt she was reading a chapter from the book of me. It all felt very familiar and connected to me. I recommend having this reading if you are interested in taking a deep dive into self, thinking about your purpose, your relationships or how you connect with the world around you. It is truly eye opening and empowering. Thank you Sharon!" "Sharon just read my [Creation Team] astrology chart and woah! Understanding ourselves is such an important part of self care. It was fascinating to see how much resonated with me and where I am in my life- where I have been and where I am going and what and who are playing a part in it all- my unique team, my masculine and feminine energies, my moon in scorpio- fueled by cancer- so much to digest and implement in life and business. I think you should let her know if this type of deep soul work interests you." "The biggest concern I have had is finding a way back to feeling happiness and a desire to be part of the larger community. The ability was somehow lost along the way. I believe part of the issue was not allowing my own needs to be considered before others. I really didn't know what I was coming to the session for, I was just trying it out as a different experience. I thought if I could somehow tap into part of myself that I haven't explored in many years it would help ignite a bit of joy.... I was wrong... lol It mostly just pissed me off. It was good because I felt really stuck while doing the process and now that I have had time to assimilate the energetic experience, I feel that it is helping me to see myself in a new and good way. It is allowing me access to part of myself that the society at large has no real use for so I forgot about it. I feel that the experience has helped me to reconnect to pieces of myself that I didn't know I had. You have personally helped me by listening and taking opportunity to lead me to new experiences and help along the way. Your peaceful and loving unassuming demeanor allows me to be comfortable to let the feelings (frustrations) out through the work without feeling strange or uncomfortable. The body work and energy work has helped to keep me grounded and balanced. The creative work is guiding me back to myself in ways I never anticipated." Laura P.
Laura S. says, "the creative process is such a powerful way to open the door for personal discovery and transformation. Sharon has a gift for creativity and holding the space for each of us to step into our process fully and discover for ourselves the gifts waiting for us. Her gentle way both encourages and creates safety in what can be a vulnerable process. I stepped fully into discomfort and came through to the other side with new learning and courage that's applicable to my life as a whole too." Jennifer C. says, "this experience has reawakened my ability to speak clearly from my heart and soul. It has polished my yearning for regular authentic creative expression. While painting I heard how to unlock new ways for meeting my limitless possibilities. I feel grounded with powerful and playful wings ready for adventure. I feel nurtured and heard and seen by the community created with fellow participants and reminded that honest sharing of self can happen anywhere within a small amount of time and can be a benefit for all." Lotus Wisdom - "Best class yet! It felt so good to bring out what was inside waiting to be created. The initial meditation brought up feelings/understanding of compassion, which bloomed to a deep sense of gratitude, love, inner peace, calming energy. I feel so much self confidence and comfort in my space in the world. I want to share these feelings with others. My cup feels full, and I am ready to help those in need of healing. Thank you Sharon!" 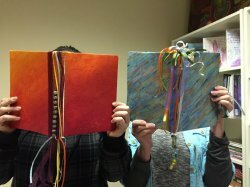 Cosmic Smashbook- "Sharon helps facilitate creativity for people who are otherwise not considered creative; in a relaxed, inviting atmosphere. We created a Cosmic Smashbook to focus our intentions and express creativity. I can't wait to add to it and enjoy it throughout the year and reflect later on the original intention." "Thank You! What a joy to start from scratch and walk away with a beautiful journal imbued with my intentions- I'm excited about the power to manifest that was created today! And look forward to how that unfolds in my life." Laura S.
"This was a very pleasant way to spend a Sunday afternoon. Working with color and texture allowed my creative side to expand. I'm looking forward to filling my Smashbook with inspirational words, pictures and art work. Thanks, Sharon!" Anita B. "What a great way to spend a weekend afternoon! 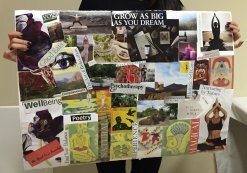 I enjoyed this workshop very much & loved how it helped me tap into my creative energy....Thanks Sharon, I had a wonderful time!" Marci H.
"I usually try to define and discuss a specific need or issue I would like addressed each time I come. Healing of an area, stress carried in neck, shoulders etc, general relaxation or fluid elimination in legs (just to name a few issues we've addressed in sessions). So every session seems to be customized which is exactly what I believe every client would want. At least that's what I love about my sessions with you. You have such a wealth of knowledge, expertise and skill. You address any need I might have so thoroughly and professionally within that session. You have great listening skills and the gift of intuitive and healing hands. I feel very fortunate to have found you." S.H. "Incredibly relaxing and healing. I have been going to Sharon for years. Her massages always integrate other modalities like lymphatic drainage, and cranial sacral therapy. Her reflexology massage is the most relaxing body work I have ever had. I have also had her Thai Poultice treatment for the body which is heavenly. When I was pregnant with my 2nd child Sharon healed my back problems. The atmosphere is very peaceful as is Sharon's presence." "I just had surgery and was under general anesthesia. I had a 90 minute rejuvenation massage from Sharon and it felt like she brought my body back to life. I would recommend this for anyone after having surgery. I feel great now." David A. "Thank You! Most amazing massage I've ever had. I think Sharon got every muscle in my body "unstressed", and I feel great. Can't wait to come back"
"The extra touches seem minor, yet they culminate into what was my favorite massage experience thus far. From the sitting area where I filled out my paperwork, to the perfectly chilled water served in a tea cup, to Sharon's perfectly applied pressure, to the hot stones used on my back, to the steamed towel to wrap my feet, and of course, the bite of dark chocolate to cap off the session...I felt like I had truly escaped. Do yourself a favor and take a moment from the upcoming holiday season chaos and get pampered at Tranquil Being...you'll be rejuvenated and ready to conquer the world!" S.Y. "thank you, Sharon, for providing a serene environment and a wonderful massage - it was a mini-vacation for me"
"Sharon Lawlor has been providing outstanding health-bolstering massage therapy to me for years. I am very discerning about massage, and have learned that not all massage is healing, and some can throw energy in a bad direction. Sharon has a profoundly grounded energy. She has incorporated new techniques over time and I can immediately feel that I am receiving the benefits of very experienced and healing hands. The effects are both powerfully subtle and surprisingly long lasting. Sharon also has a beautiful, soothing spa-like environment, with a cutting edge infra-red sauna that is helpful before massage. This is as good as it gets." "From the minute I walk into tranquil being I feel more relaxed. Sharon has designed the Center with every attention to detail and it feels like a sanctuary! I have been getting massages from her for 3 months. She is attentive to every detail of my needs. I leave with my pain relieved and anxiety and stress gone! Sharon has a deep understanding of how the body works and she explains what she is doing and how it alleviates the pain. From the organic oils to the yummy custom hand made chocolate to the warm soothing teas each visit is divine!" "First time going yesterday and it was a wonderful experience. Sharon was very knowledgeable on her craft. I will definetly be coming back." 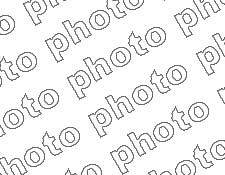 Tim K.
"just finished my 2nd massage with Sharon. I am speechless, all custom work for my needs. Such smooth touch. Thank you for this friend." D.B. "A visit to Tranquil Being is a must! The atmosphere is warm, inviting, relaxing and every care is given to your privacy. I just tried the infrared sauna and found it did amazing things for me. I definitely will use the sauna at every visit! Sharon is my therapist and she is second to none, (I’ve been getting massages for 20 plus years)." MaryAnn M.
"Wow! I'm a massage therapist myself, and Sharon just gave me one of the best massages I've ever received! I will definitely be booking with Sharon again..." Brooke B. "Each time I come to Tranquil Being, I relax from the moment I step through the door. The way Sharon designed the place, it is a sanctuary for me to retreat and relax. The scents, music and soothing colour scheme are lovely. When I think of a place of relaxation, I think of Sharon's spa." Dorothy L.
"Sharon is amazing. I consider her a healer because no matter what ails my body, she's able to tell me and provide recommendations. I try to see her twice a month for deep relaxation. 90 minutes with her feels much longer, yet when it's over, I wish it were longer." Dorothy L.
"An absolute talent. Sharon's the best. I had an Herbal Poultice Massage and I can not say enough about it, heated massage, aromatic, extremely relaxing, the list goes on and on. Thanks so I feel great." "I used to live in LA and traveled a great deal around the country. I've received many massages from therapists in major cities and small towns alike. Sharon is amongst the TOP 5 therapists in my many experiences. I highly recommend you contact her." L.W. "Going to Sharon helped me to stay healthy, clear-headed, and peaceful during one of the most stressful phases of my life." C.A. "Sharon's renewal massage was a blissful experience. I spoke to my wife on the phone afterward and based on just the sound of my voice she told me, "Your aura sounds different!" We both laughed, but it was true!" C.M. "Sharon was amazing! She instantly helped me relax while she provided soothing comfort to my aching muscles. During my pregnancy as my belly grew my back muscles and ligaments were stretched and sore from all of the extra weight. My massages with Sharon helped relieve that sore feeling instantly and my body was so grateful. My time with Sharon was both physically and mentally therapeutic. I would definitely recommend her massages during and after pregnancy." Kori S.
"Sharon made a huge difference to how my body felt after just one massage session. I have had problems with my digestive system - bloating, general sluggishness for a few years, my doctors have not been able to help me. I went to Sharon to get a lymphatic massage. She gives me useful advice and tailors the massage treatment. I had not slept for more than an 1 hr continuously for months. After the 1st treatment with Sharon, I managed to sleep for 4 hrs straight and also felt like I had more energy. She combined a 1/2 hr of lymphatic massage with 1/2 hr of reflexology since I have been having pain from heel spurs. Sharon is very courteous and uses the full hour for massage unlike other places where a full hr massage would mean just 36-45 min. I would recommend Sharon to my family and friends." M.M. "Pregnant with my 2nd child, and chasing around a toddler, I have had aches and pains that I never had the first time around. I have come to rely on massage therapy for relief of my discomfort. Sharon has been incredibly healing to all the ailments from which I have been suffering. First I strained some tendons/ligaments while moving furniture. I was in pain for 3 days until I saw Sharon for a massage. She identified the source of the pain immediately and I felt 100% better immediately after the massage. Next I developed Sacral pain. After 2 weeks of limping around I got a sacral adjustment which took away 10% of the pain and then a massage, including lymphatic drainage techniques, which took away 80% of the pain. During the sessions with Sharon I have felt more relaxed then I have ever been. She is a calming presence and her massages are a blissful experience!" J.E. "Sharon's fertility massage is the perfect way to center and prepare myself for the month's amazing opportunity to conceive a child. This session with Sharon has helped me approach the month's process with groundedness and trust in the wisdom of my body, my future child, and the universe. I love the sense of peacefulness and calm Sharon creates at the beginning of the treatment, enabling me to let go of what I don't need and, as she encourages, to invite my child into my life. The fertility massage is also a total treat! Sharon is so attentive and responsive to my individual needs and situation; she is a great support to me in this process." Catherine M.
"The poultice massage was more that I ever expected it would be...using the poultice, Sharon was able to reach even deeper into my tissue and muscles for a more relaxing experience. I even fell asleep and when I woke up I felt relaxed and energized. The herbs contained in the poultice not only smelled fantastic during the massage, but I could smell them for the rest of the day until I showered. I plan on having another poultice massage soon!" K.S. "The Thai poultice massage was an incredibly tranquil experience." J. E.
On Seva Stess Release: "Perfect amount of time to bring you into your day" Ana P.
When you look up the word "amazing" in the dictionary, Sharon 's picture should appear beside the definition. I have been coming to see Sharon for regular massages as well as reflexology for years. However, one day during a reflexology session I experienced some major discomfort when she was working on a point in my foot that was directly related to my reproductive area. We began talking about the fact that my husband and I had been dealing with infertility issues for years and we were in the process of starting IVF. Sharon mentioned that she was currently taking classes on Fertility Massage and asked me if I would like to have her try a few of the things she had learned on me. I said yes and so began my journey with Fertility Massage under Sharon 's care. I had many sessions and as time went on I even had sessions with the castor oil packs. They were fantastic and I decided to do them at home each night as well. I truly believe the sessions helped not only increase the chances of us achieving pregnancy, but also to help me be more in tune with my body and prepared me for the journey to motherhood. I decided to have a massage with Sharon to keep my self relaxing during the time I was waiting to find out if I was pregnant. When we found out that we had finally achieved a successful twin pregnancy, I called Sharon to tell her I had some great news to share. When I told her that we were expecting, she said she already had sensed that in my last massage and also that she had a feeling it was twins! She had actually felt their presence during the last massage!! Since everything had been so wonderful, I decided to continue with pre-natal massages as well. Again, I have had many pre-natal sessions and have truly enjoyed each one of them. They help to keep me relaxed, balanced and sane! I can not thank Sharon enough for not only her support with massages but her emotional support and knowledge that she has shared with me. She is truly a blessing and everyone should consider adding massages (of any kind) from Sharon in their life." K.S. "I have seen Sharon a handful of times now for massages and all I can say is WOW!! She does an amazing job and you will walk out of there feeling like a new person. I felt very comfortable with Sharon so I was able to just relax and enjoy my massage. Sharon is professional, friendly, and very good at what she does!" "Truly amazing! After years of numbess and pain Sharon has managed to eliminate the discomfort after only a few sessions. I look forward to each week knowing that it will not only be good therapy, but will be a truly enjoyable experience! In addition, Sharon offers great suggestions for a healthy life-style and exhibits tremendous knowledge of the body, mind and soul. My time with Sharon has been wonderful!" Michele W.
"Ever wish that you could be totally relaxed and let you mind go? That is what I feel like when I have a massage with Sharon. I have experienced many different massages and Sharon by far is the BEST! My only wish is that I could afford to have a massage by Sharon twice a week!" Kendra S.
"I've had a full body massage as well as foot massages from Sharon. I didn't realize how tense I was until after I was worked on. I could feel my inners just melting with each stroke of her hand. Afterwards, my stress went away, I felt stronger, and mentally it was a slice of heaven. As a woman, I think I'm entitled to a little bit of relaxation!!!!! :-)" Gale J. "I recommend a massage at least once. It's the most relaxing, refreshing hour one can experience. I prefer a Swedish massage, it's soothing and gentle, but very effective in releasing aches and tightness in muscles. [She] gauges her pressure according to your directions and, of course, the pain in the muscle she is working on. Each stroke slowly releases the ache and the feeling is euphoric. She works on legs and feet, arms and hands, shoulders and neck... Soothing music and gentle stroking makes one feel like they are floating. After a massage the world is a better place to be! Bet you won't just have one massage!" Elaine N.
"She is a very caring person who takes pride in her work... Her main goal is to make you feel better... I am a very tense person due to some health issues and she is a marvel the way she relieves my knots. I would recommend her to any one who needs to relax or relieve soreness like me. You have to try her out!" Sam M.
"Another added benefit is the warm and smiling faces of Sharon and Megan. Sharon provides treatments and Megan takes care of the sauna clients. They are wonderful healers and excellent listeners. I truly look forward to seeing them each week. Sharon’s treatments have been lovely. I’ve enjoyed two. The first was to address the last bits of leaky gut and to ease stress from my job. The second was a relaxing facial poultice treatment. Both treatments left me relaxed and asleep on the table. The days following were found with inner peace and the ability to breath deeper.